Our in-house vet has hand-picked suitable alternatives for each Royal Canin dog food. Should you choose to give your pet an alternative diet, it is important to make the change gradual. This means that you should mix the old and new food for about a week. A suitable schedule for this would be as follows: use 2/3 of the original diet mixed with 1/3 of the new diet for the first two days; followed by 2 days of 1/2 of the original diet mixed with 1/2 of the new diet; followed by two days of 1/3 of the original diet and 2/3 of the new diet. After this, you can switch to the new diet entirely. 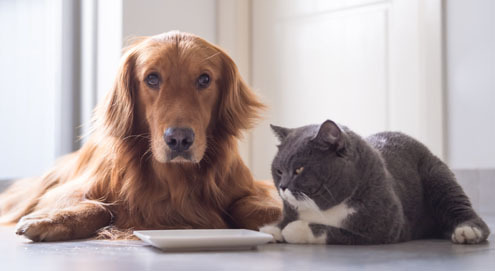 Your dog or cat may develop some slight gastrointestinal complaints, but these should be of a temporary nature. In the event that these complaints persist, it is advised to contact your local veterinarian. *Unfortunately, we are unable to offer an alternative that incorporates two different types of kibble. The listed alternative diet is the most suitable alternative. ** Unfortunately, we are unable to offer an alternative bladder diet for small dogs. The listed alternative diet is the most suitable alternative. ***Please note: This diet is not an exact match. Before switching to this diet, we would recommend discussing whether or not this is a suitable diet with your local veterinarian. *Unfortunately, we do not have an alternative that comes in a powder. The listed diet is the most suitable alternative that contributes to recovery after surgery or a disease. *Unfortunately, we do not have an alternative dental diet for small dogs. The listed diet is the most suitable alternative. Please note, the kibble is quite large. * Unfortunately, we do not have an alternative that includes hydrolysed feather protein. It is important to discuss which diet would be best suited for your dog, with your vet. **Unfortunately, we cannot offer an alternative hypoallergenic diet for small dogs. Please note: the listed alternatives contain different sources of protein than in the Royal Canin diets. It is important to discuss which diet would be best suited for your dog, with your vet. ***Unfortunately, we do not have an alternative diet for small dogs. The most suitable alternative contains regular-sized kibble. * Unfortunately, we do not have a suitable alternative for this diet. We do offer numerous supplements that can help diminish anxiety, stress and/or fear. It is advised to discuss this with your local vet.